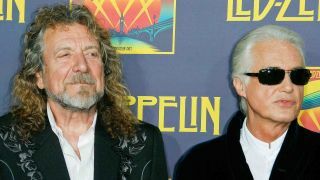 Jimmy Page and Robert Plant will face a jury trial over similarities between Led Zeppelin's 1971 classic Stairway To Heaven and Spirit's Taurus, recorded in 1967. The trial is due to take place on 10 May, after US district judge Gary Klausner said there was "substantial" similarity between the songs; a jury will now determine whether Page and Plant are liable for copyright infringement. "What remains is a subjective assessment of the 'concept and feel' of two works… a task no more suitable for a judge than for a jury." Michael Skidmore, a trustee for the late Spirit guitarist and songwriter Randy Wolfe - AKA Randy California - brought the lawsuit. His lawyer, Francis Malofiy, stated, "This case, from our perspective, has always been about giving credit where credit was due, and now we get to right that wrong." Led Zeppelin opened for Spirit on the rock legends' first US tour in 1968, and Page has also admitted to possessing a copy of Spirit's first album among his record collection, although he claims he "did not hear Taurus until 2014". Are the two songs really that similar? And have we all actually been playing Taurus in guitar shops all these years? Listen to them both below.